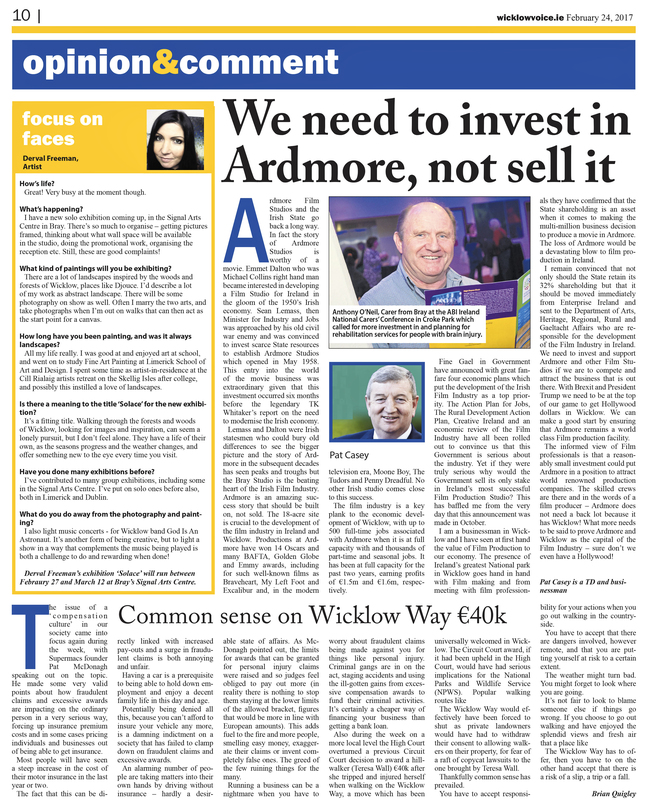 In this weeks issue of the Wicklow Voice today. Issue February 24th 2017, ahead of Solace Exhibition next week. A short interview on page 10 with the very talented poet and journalist, Brian Quigley. Have a read further down. Great! Very busy at the moment though. reception etc. Still, these are good complaints! What kind of paintings will you be exhibiting? the start point for a canvas. and possibly this instilled a love of landscapes. Is there a meaning to the title ‘Solace’ for the new exhibition? offer something new to the eye every time you visit. Have you done many exhibitions before? both in Limerick and Dublin. What do you do away from the photography and painting? both a challenge to do and rewarding when done! Febraury 27 and March 12 at Bray’s Signal Arts Centre.